The music biz has enough superwomen; but only a few true artists dare to show their weakness, vulnerability, and humanity. There is an "I am woman, hear me roar" aura that fits most famous female pop artists like a suit of armor. Fiona Apple doesn&apos;t have that. When she sings, her voice see-saws between threatening and on the brink of crumbling. On "Every Single Night," the first single from her new album, The Idler Wheel, you can hear these opposite tones dance with each other uncomfortably. At times she sounds fearless and at others, Apple&apos;s quivering voice sounds like it could shred into tiny scraps at any moment. But it doesn&apos;t, and there is a kind of strength in that. Over the past years, the idea of a "strong woman" in popular music has been mostly one-sided in its portrayal. The complexity of what makes these women strong has been reduced to sugar-coated anthems of independence, confidence, sexuality, and pride. In these songs there is no shame, no regret, no embarrassment. The best example of this kind of song might be Beyoncé&apos;s "Single Ladies." It’s a song written by Knowles with the help of three men: Christopher "Tricky" Stewart, Terius "The-Dream" Nash, and Thaddis "Kuk" Harrell. The celebratory smash captures the essence of Beyoncé’s alter-ego, Sasha Fierce, and has come to represent the proud pinnacle of independent woman anthems of the past decade. Fiona Apple doesn&apos;t have a "Single Ladies." Not even close. Instead of celebrations, her songs are the stories of internal battles in some misunderstood, never-ending war with all the emotion she soaks up from the world. She wears her scars proudly and flaunts vulnerability with her revealing lyrics that read as if they were clawed into the paper. Her visceral approach can make for some heavy, sometimes overbearing music, and it’s not always a pretty role to play. But it’s an important one. "Everybody sees me as this sullen and insecure little thing,” Apple explained in a 1996 interview with Tracey Pepper. “Those are just the sides of me that I feel it&apos;s necessary to show because no one else seems to be showing them." She&apos;s right. In 1996 and in 2012, insecurities are blanketed by positive messages and overcompensation. 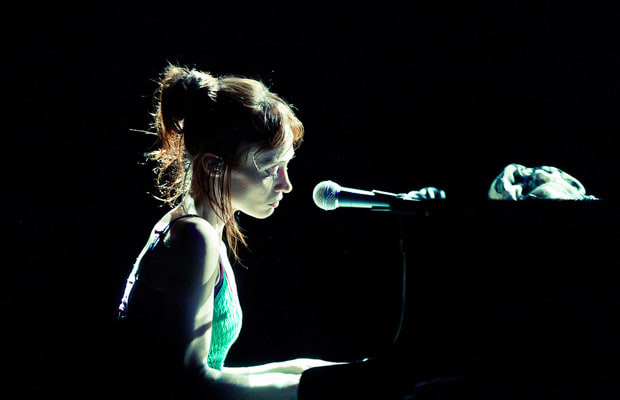 Fiona Apple is not a superwoman; she&apos;s the woman that every little brother sees in his big sister. We all see our sisters and mothers as strong not just because we&apos;ve seen them at their best. It&apos;s because we&apos;ve seen them at their lowest points too—we know what they&apos;ve been through, and we&apos;ve watched them hold it together through it all, no matter how ugly it gets. We’ve seen them at their most human. There’s an openness in Apple’s music that gives us insight into a real person instead of a public image, character, or alter-ego. She may be reclusive and private in nature, but when it comes to music, she hides nothing. Apple has been open about being raped, suffering from OCD, and struggling with an eating disorder. Through everything, she’s never had the disposition of someone who’s been defeated. Instead, she fights back with a poisonous tone and hardened temperament. Her visceral approach can make for some heavy, sometimes overbearing music, and it’s not always a pretty role to play. But it’s an important one. This willingness to show the unglamorous side of things comes across in her music, too. On “Left Alone” she sings, “It hurt more than it ought to hurt, I went to work to cultivate a callus / And now I&apos;m hard, too hard to know, I don&apos;t cry when I&apos;m sad anymore.” Her songs are not afraid to get ugly, painful, and even in the most musically accessible moments, there’s a touch of dissonance to make everything slightly uncomfortable. Calling Fiona Apple’s The Idler Wheel beautiful would be fair, but it’s the ugliness in this album that really makes it what it is. It’s when Fiona’s scratchy voice breaks out into a primal yell on the chorus of “Regret” or when she turns the fun piano bounce of “Periphery” into whatever the exact opposite of a love song is—these are the moments that give the album a powerful human element that’s hard to come by and impossible to manufacture. She may be a stark contrast to the airbrushed images that we’re used to, but The Idler Wheel is Fiona Apple, bunions and all.